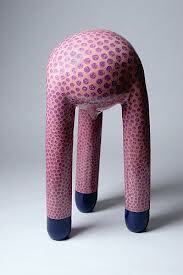 Loving American Craft Council's "Heck Yes Craft" Blog! 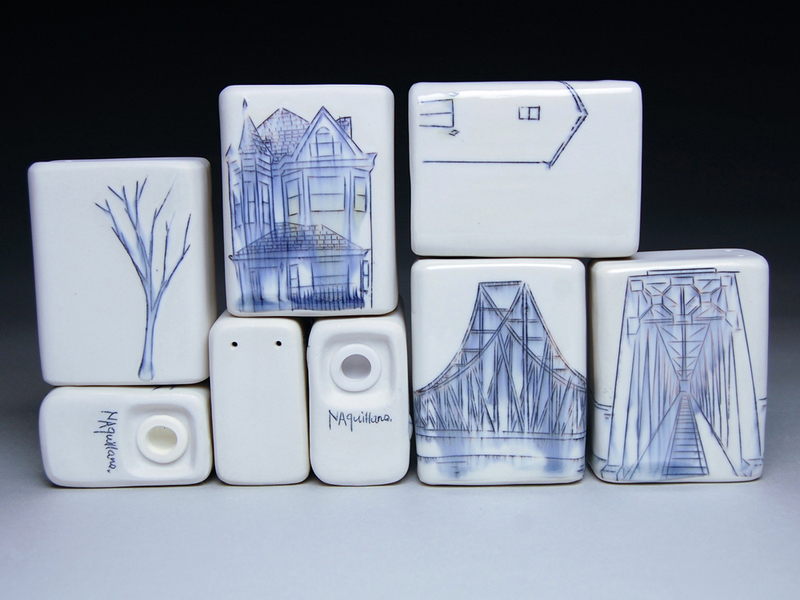 Architecture is everywhere in Nicole Aquillano’s compelling functional ceramics: meticulous, towering bridges; intricate, imposing houses; densely packed neighborhoods; suggestive staircases. Precise, familiar details pop out of Aquillano’s beautifully sculpted mugs, bowls, and platters: bricks, roof tiles, symmetrical spans. 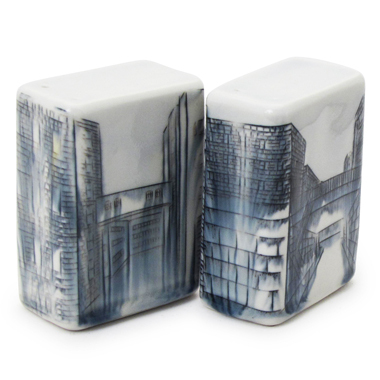 The artist’s own glazes - dark and shadowy, with pops of yellow to convey the light of habitation - bring each piece’s urban vibe to life, evoking the constant movements, shifts, and changes of the city. Can’t get enough craft? Neither can we. Heck Yes Craft is a series of visual blog posts with a simple mission: to show off amazing work. Come back on Fridays for more. Hope you are enjoying the last bit of summer...I have been busy in the studio preparing for some upcoming artist talks and fall sales! On Thursday, September 26th at Harvard Ceramics, mark your calendars to come hear how and why I make my work! This new voices lecture starts at 5:30pm and is free and open to the public, just be sure to RSVP! Fall is a busy time for sales, with the holidays fast approaching (they will be here before you know it)! 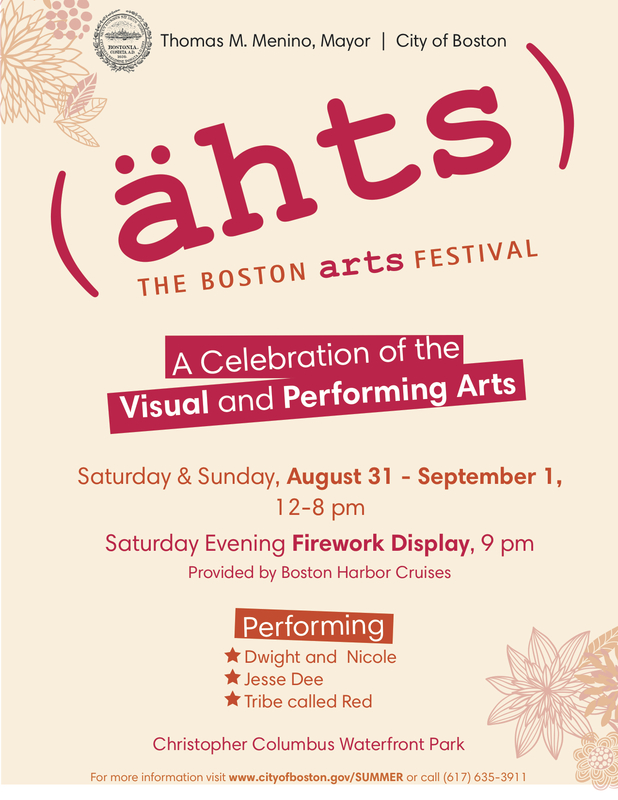 First up, this weekend is the Boston Ahts (Arts) Festival in Christopher Columbus Park, complete with a great line-up of artists including both makers and performers. Be sure to check it out this Saturday and Sunday from 12-8pm, and stop by my booth and say hi! Don't miss the fireworks at 9pm Sunday! 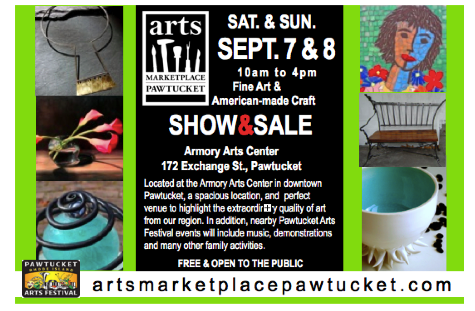 Then next weekend if you happen to find yourself in Rhode Island, be sure to stop by the Arts Marketplace: Pawtucket! The event runs Saturday through Sunday, September 7th & 8th from 10am-4pm at the Pawtucket Armory Arts Center, 172 Exchange Street, Pawtucket RI. After that is a weekend off, to gear up for the following weekend with a truck show at Fire Opal, located at 683 Centre Street, during Jamaica Plains Open Studios: Sept 21-22nd...details to follow! Thanks for taking the time to hear my news! 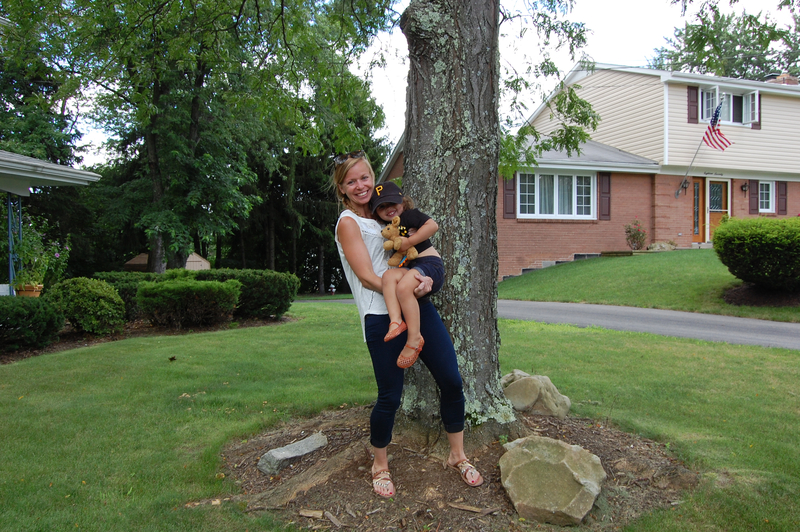 Hope you have a great labor day weekend! Today is the day! 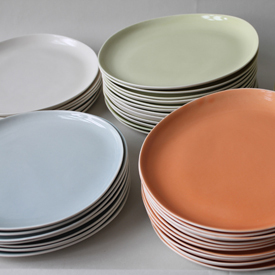 Vote for your favorite maker on Martha Stewart American Made! It's easy, just register and then you get to place your vote! Last week was a bit of a blur, spent the weekend and the beginning of the week in NYC at the NY International Gift Fair (NYNOW). It was a great experience that I can't wait to do again (February!? ), and now and I am home with a bunch of orders to fill! Look for my work coming soon to a gallery/store near you including in Los Angeles, San Francisco, New York, DC, Ohio, and close to home at Worcester Center for Crafts! 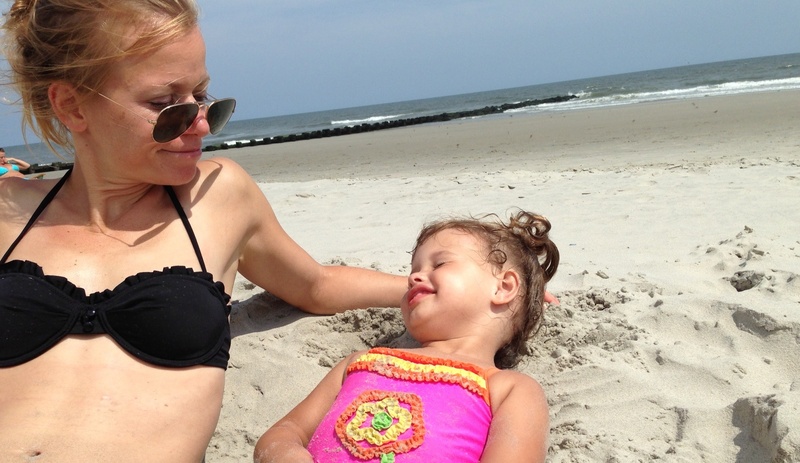 After the show, I met my family for a much needed vacation on the Jersey shore. It was just what I needed. Oh the lazy days of summer? Mmm, not so much!? Things are hopping here in my studio, doing some last minute preparations for the NY Gift Show which has snuck up on me! 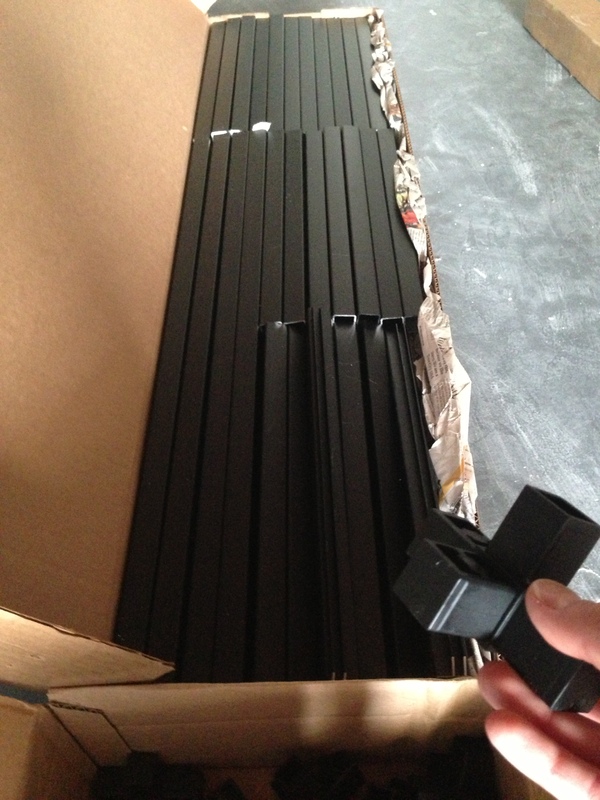 Going to attempt putting together my new booth display which is made up of Esto Connectors (extruded aluminum) and plexiglass shelves. It's a custom design thanks to my wonderful husband Sam...no wonder it's like a giant k'nex system! 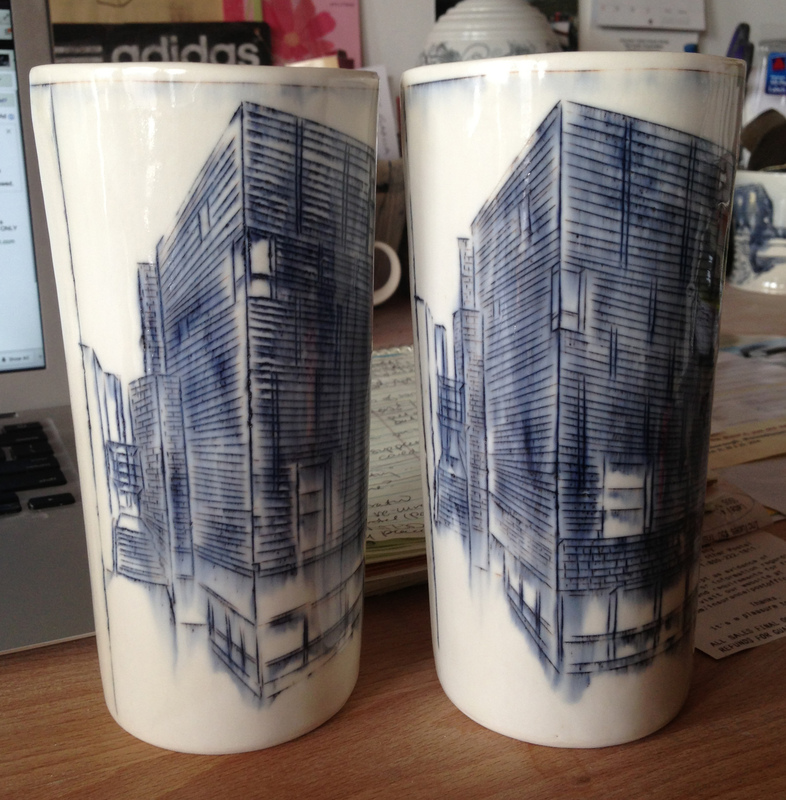 See the photo below: Other news in the studio: The new beers steins are a hit, I totally want one! And I've been working on a custom vase for the RISD museum store, just need to add the "RISD" decal and they will be done! 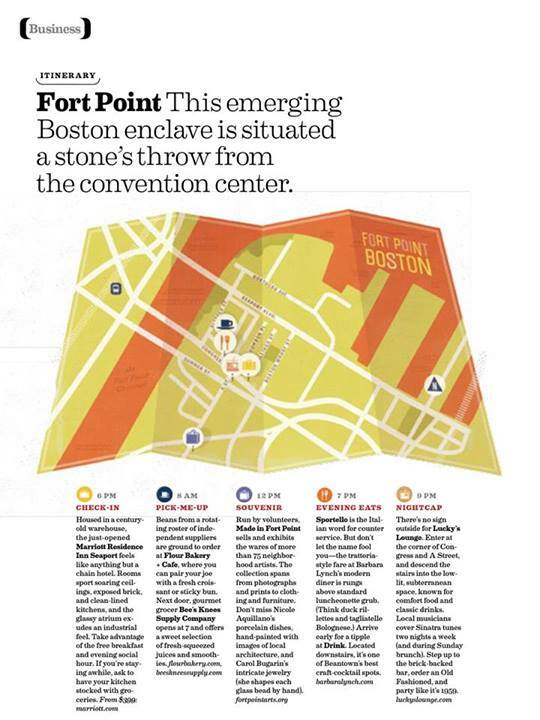 And last but not least, the subject of this post: Fort Point has been featured in Southwest Airlines Magazine! With a special shout-out to the work of yours truly as something to not be missed! Exciting! [caption id="attachment_960" align="aligncenter" width="432"] Southwest Airlines Magazine[/caption] With that, I'm off to a productive studio day. Lots of custom orders in the last week, going to unload a bisque kiln and glaze away! Sometimes I stop and think, "man...I have the coolest job ever." This is one of those days. Hope you have a great one! 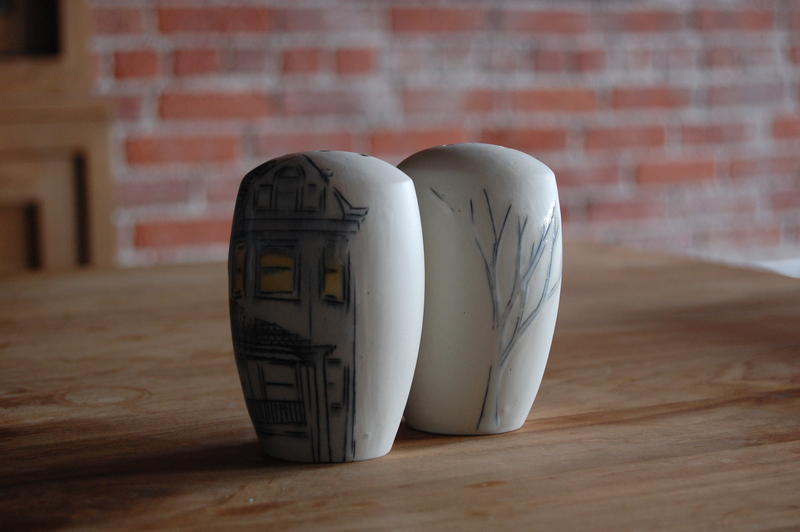 Awhile ago I sent this tumbler set off to Virginia for the Workhouse Clay National 2013, which opens Saturday, August 3rd. I can't believe its next week! Where did July go? It definitely doesn't feel like it's almost August here in Boston, just a few days ago it was a cool 62 degrees. Although I'm not complaining - I took full advantage and fired up the kiln and went for a long run - I could get used to this weather! Also upcoming in August is the 20th Annual Strictly Functional Pottery National 2013, where I'll be sending this little espresso set: And last but not least for August, vote for me August 26th for Martha Stewart's American Made! I'll try to send out a reminder closer...remind me! 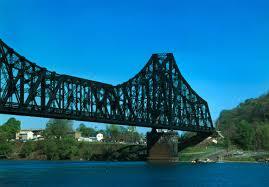 Stay posted for some new bridge work coming your way soon. 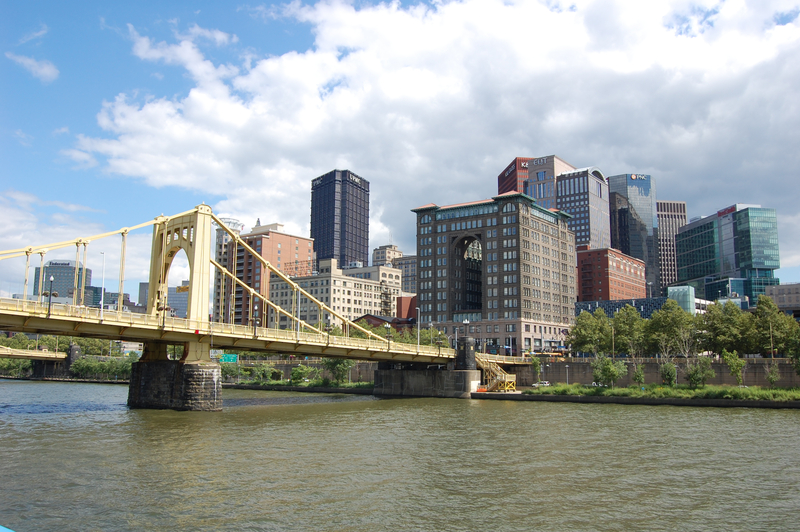 I spent the weekend in Pittsburgh taking new inspiration photos - both of the houses and places in my hometown and of the bridges in Pittsburgh. I even got on a boat to get the bridge pictures I needed (those of you who know me know how big of a deal that is!) 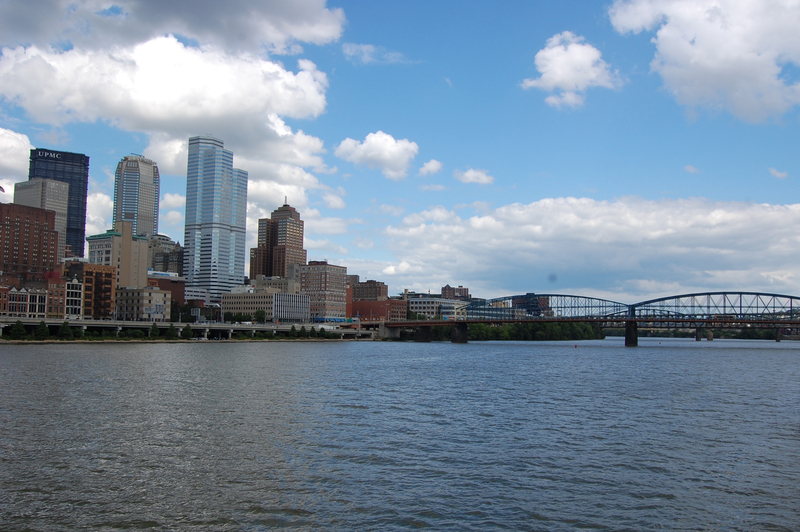 And of course I had to take a picture for my niece, who asked me to "Take a picture of my beautiful city, Cole." Miss that girl already! Have a happy day! Or maybe I should say - have the day you have! 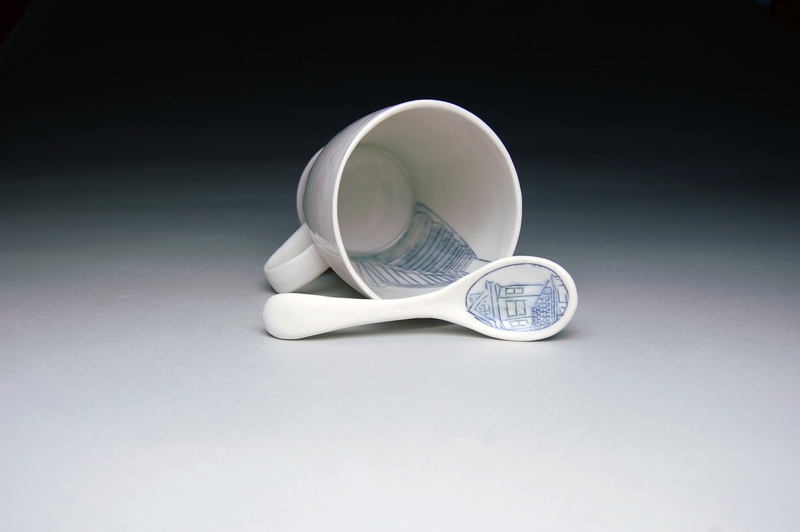 Above is the piece, and detail shot, of the mug and spoon that I'll be sending to the Minnesota Women Ceramic Artists Possession exhibition at the Duluth Art Institute, juried by Margaret Bohls and Eva Kwong. I've included images of their work along with their artist statements, below, as it's so interesting to hear why/how other people are driven to make. And I especially love Eva Kwong's reference to the Nature Lab at RISD - there are certain things I really miss about that place! 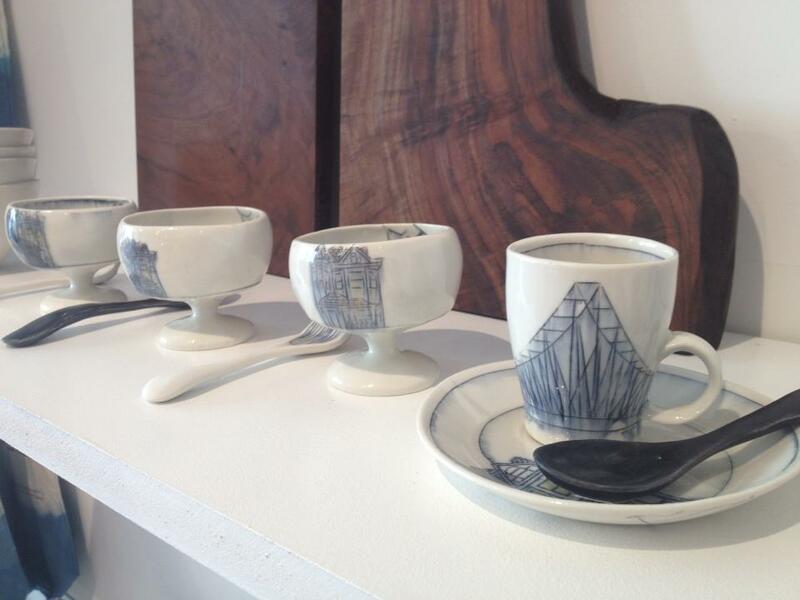 Margaret Bohls Interior volume is a key element in functional forms. It defines the potential for containment. This body of work combines a strong sense of interior volume with a net- or grid-like surface of textural lines that contains and shapes that volume, creating buoyant, full, yet architectural forms. These seemingly upholstered forms are draped with a series of rich, complex glaze surfaces, many of them crystalline, lustrous, or having deep visual texture. These surfaces are sometimes further adorned with sprigs, floral glaze decals or metallic lustres. 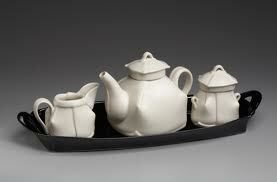 Porcelain forms are often placed in or on earthenware baskets or trays. The result is a layering of disparate and complex elements that become integral. These pieces, in form and in the details of form, are created to visually communicate their use or function. Their complex shapes and rich surfaces embellish and enhance this use. Eva Kwong Much of the inspiration for my work comes from my observations and wonderment of the natural world within and around us. The time spent with my grandmother as a young child out in the countryside in Hong Kong established the start of my lifelong interest in nature. She taught me to notice all the small details -like the pink blush on a peach, the various greens on a frog or the changing patterns of waves, etc. She showed me the joy of making things- the possibility of taking one material and transforming it into something else with your own hands and imagination. The other influential experience began when I was a work-study student for the Nature Lab at the Rhode Island School of Design in the early 70s. Those 20 hours a week gave me an immersion in the shapes, colors, patterns, structures and principles found in organic form and the human body. I studied Asian Art from China, Japan, India, and Korea in school as well as on my own. I am interested in how images, forms, colors and patterns are transferred from one culture to another and how our relationship to nature is expressed at different times. This research experience in Asian Art and Natural Forms generated the visual vocabulary that informs all the work that I do. I like to make things. It is my way of experiencing and understanding the world through my own filter. It is like ”tapping”, a term used by the Australian bushman to refer to a sense of an animal or water nearby. It is a gut-felt, intuitive impulse to puts things that I feel, think about, question or observe in my life into concrete form. Why not make a beer stein?! 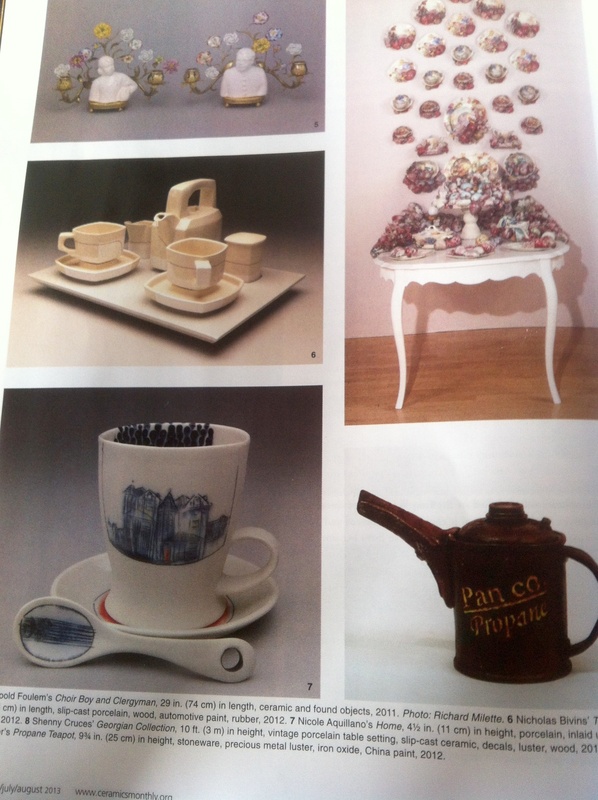 Especially if someone asks, like the nice folks at Claymakers, for their upcoming Steinzeugkrug Exhibition! 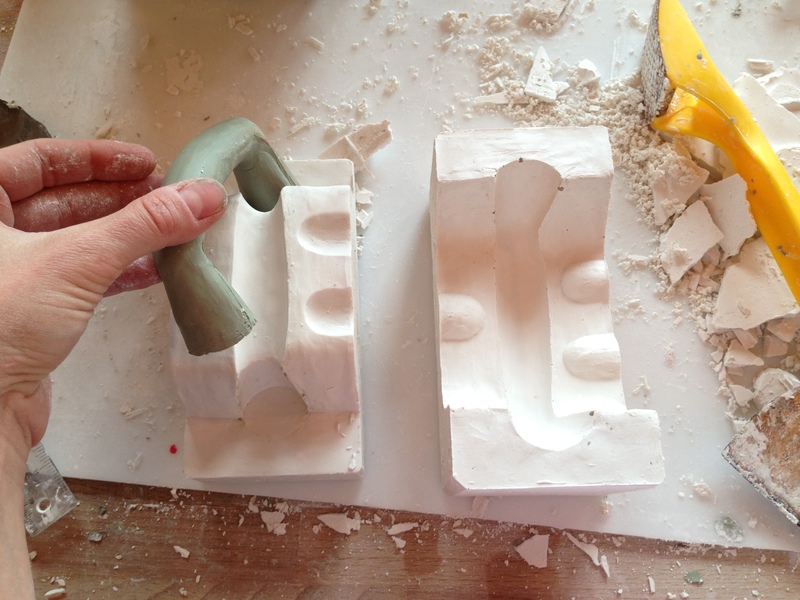 So I made a new handle mold (this image is of me removing the plasticine prototype): And then whipped out a test stein (above), which is in the glaze kiln right now. Tomorrow will be like Christmas...in July! (Right now my studio feels like a sauna though). Looking forward to things cooling off tomorrow when I pull this guy out of the kiln. Guess I'll have to really put it to the test with a nice cold beer! Made a trip to Harvard Ceramics yesterday to hear the wonderfully talented Robin Best speak about her work in the New Blue and White Show at the MFA. She uses china paints on all of her work - incredible. 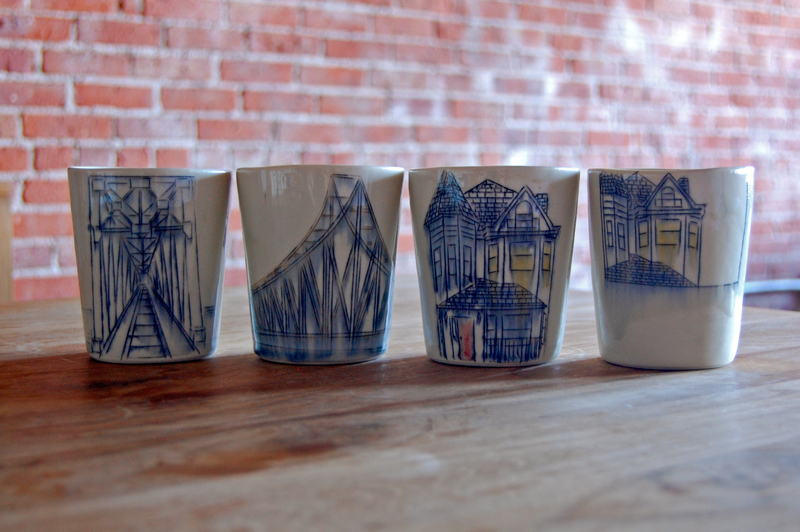 Anyone can appreciate the immense detail on her pieces, but for anyone thats ever tried china paints: mind blow (me). I especially love her duo of tiny vases that she actually painted under a magnifying glass! Her images are historical references that she collages in such a way so as to create a narrative around the pot...and she compliments each piece with a written narrative of her own. Glad I went - it was inspiring in all sorts of ways! Now off to the studio! Have a great day! Trying out something new - a Made-to-Order Shop in addition to my Etsy Shop - so you can order exactly what you want and I'll make it to your specifications! Take a look and let me know what you think! 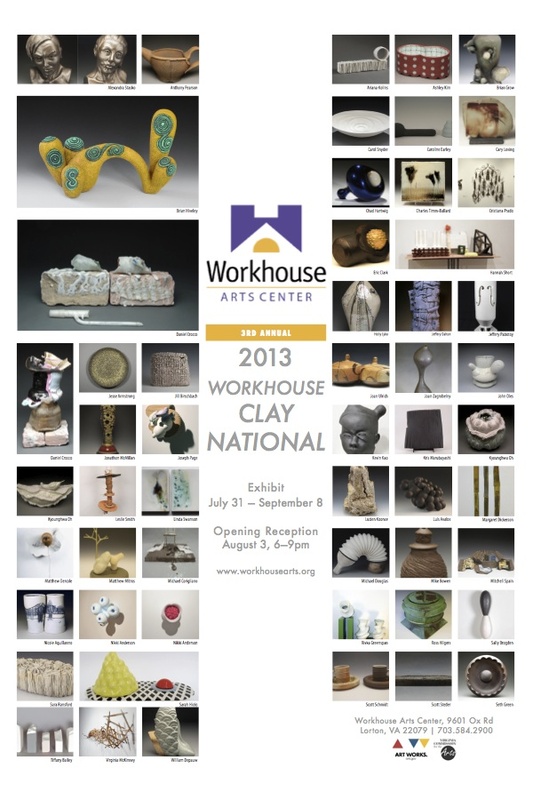 Excited for the upcoming opening of the 3rd annual Workhouse Clay National in Virginia. It's gearing up to be a great show with a bunch of amazing work, as you can see from the postcard! 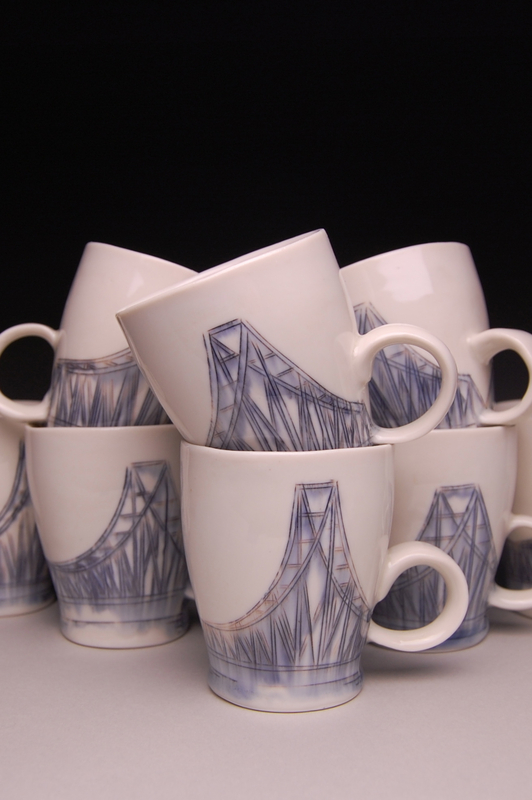 I'm super excited to show some new work: check out the bridge span on my two little tumblers. 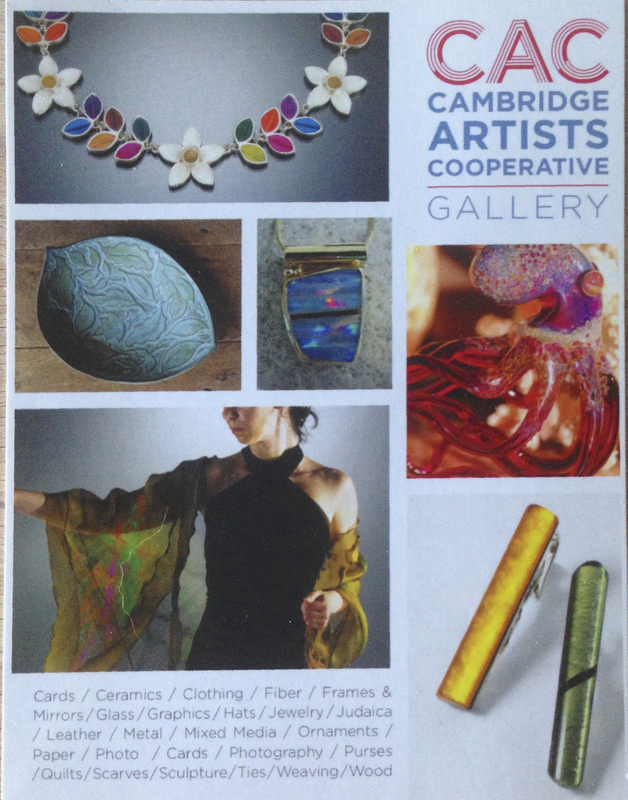 And also excited for the Cambridge Artists Cooperative Gallery in Harvard Square to start carrying my work! Super close to the Harvard T stop and filled with a ton of handmade work that is sure to knock your socks off. Be sure to make a trip to Cambridge to check it out! And if you're out near Belmont, don't miss this awesome little shop: Alchemy 9.2.5. There's so much amazing handmade jewelry there I could shop forever, plus a nice collection of choice ceramics! What could be better than a free art event with some amazing beer this weekend!? As part of the Chelsea Art Walk, my work will be showcased at the fabulous and fun Mystic Brewery this Saturday and Sunday from noon-4pm! There's tons going on around the area for the Art Walk, check it out below. Come take a brewery tour, have a beer, and check out the art! Welcome to the "Chelsea Artists' Collaborative" Gallery Page for the 5th annual 2013 Chelsea Art Walk in Chelsea Massachusetts. The Pearl Street Gallery 100 Pearl Street Chelsea, MA 02150 617.875.3188 If Beauty is in the eyes of the beholder, then come see how artists Rick Zonghi, June August, Jennifer Dulin, Brigette Grenier, Nora Bolinski, Joe Greene and others define it in paintings, photographs, prints and mixed media. Art Walk hours are June 15th and 16th 12:00 - 6:00 pm. The Gallery @ Spencer Lofts 60 Dudley Street Chelsea, MA 02150 "Intrinsic Form: Creating in 3 Dimensions", amazing sculpture in metal, stone, clay and wood by artists Madeleine Lord, Eileen Gagarin and David Dowling, David Lang, James Lentz, Cailigh MacDonald and Rajiv Ramaiah. Art Walk hours are June 15th and 16th 12:00 - 6:00 pm. New England Sculpture Service 214 Arlington St Chelsea, MA 02150. Tour a working foundry and see how huge bronze sculpture and statues are made, from concept to completion. See finished works in the gallery by North Shore artist Beverly Seamans. 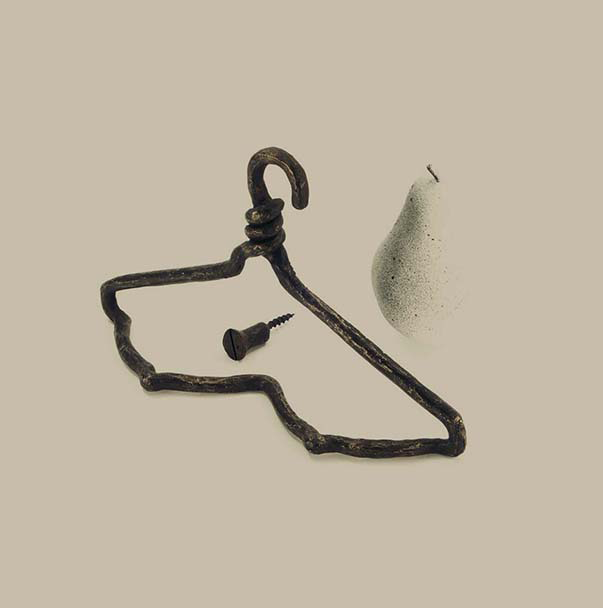 Make and Take an Iron Sculpture: Watch as 3000 degree molten iron is poured into your very own handmade design. Art Walk hours are June 15th and 16th 12:00 - 6:00 pm. The Gallery @ Chelsea City 173 Washington Avenue Chelsea, MA 02150 in historic Cary Square "A Dream of Chelsea", a photographic essay by Cody Burridge; an exploration of imagined nocturnal conciousness. Art Walk hours are June 15th and 16th 12:00 - 6:00 pm. Historic 1657 Bellingham - Cary House 34 Parker St Chelsea, MA 02150 The Governor Bellingham-Cary House Museum is a rare, historical house museum that dates from 1659. Originally built by one of the early governors of Massachusetts, the house includes the work of artisans spanning 300 years. Guided tours of the house will be at 1, 3 and 4 p.m. on Saturday and Sunday. On display will be paintings of Chelsea by local author and artist, Arnie Casavant, textiles and beadwork from the museum' s collection will also be shown. Art Walk hours are June 15th and 16th 12:00 - 6:00 pm. Chelsea City Hall Gallery 500 Broadway, 2nd floor, Chelsea, MA 02150 " Public School Art " The best of student art from Chelsea Public School pupils will be on display at Chelsea City Hall Gallery. Come see the creativity of Chelsea's diverse cultural student population, all grades will be represented. Art Walk hours are June 15th and 16th 12:00 - 6:00 pm. The Apollinaire Theatre 189 Winnisimmet Street Chelsea, MA 02150 617.884.6181 Chelsea playwright Robert Boulrice presents his science-based, game show comedy "Bertalanffy, the Game - Act 1". Norton-nominated actor Steve Barkhimer directs and stars as the game's master of ceremonies. The game asks the rhetorical question, "How full is the glass?" and may or may not deal with the end of the world. It is very funny. As a bonus for attending, the playwright invites the audience to tell him how they think the game will end. Show times are 2 and 4 pm, both Saturday and Sunday. The Apollinaire Gallery will be showing "Home Body", exploring inner and outer bodies by local artists. See new paintings by Sharon Lacey and an installation by Rafael O. Ayala. Art Walk hours are June 15th and 16th 12:00 - 6:00 pm. Chelsea Community Garden The corner of Ellsworth St. and Hawthorn Court; off Hawthorn St Chelsea, MA 02150 The Chelsea Community Garden exhibits the imaginative work of both gardeners and artists at its 3rd annual Scarecrow Exhibit. As old as agriculture itself, scarecrows have always been a practical way to keep fields and gardens safe from predators. Join our gardeners for fun with art demonstrations, goodies, plants and quilt raffle! Drumming Circles Stebbins Fountain, Chelsea Square, Chelsea, MA 02150 Please join Chelsea residents and members from N.E. Drummers who will be holding a drum circle honoring the memory of former Lewis Latimer Society and N.E. Drummer Brother, Michael Limberakis. All musicians are welcome to sit in. June 15th and 16th, 1:00 - 4:00 pm Contact Ron Robinson at 617-466-4353 for info. excited to start taking images of work in context! Check out my new work at Crimson Laurel Gallery! Below is a sampling of what's up for grabs, but be sure to check out their site to see it all! A vase with an image from the North End, the reason I moved to Boston..it felt so much like Italy, how could I not? 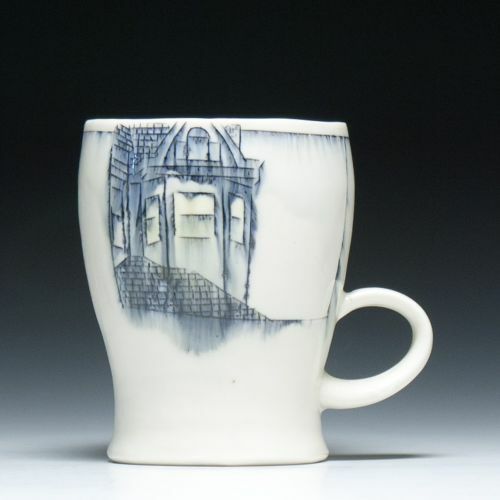 A mug with an image of my childhood home on the outside, with a staircase on the inside. A plate with an image from the place I call home now, Fort Point. And last but not least, a large platter. Makes me almost feel like I'm home. Miss this guy already! well, summer has finally come (thank goodness!) and i just wanted to take a minute to post what i've been up to...a stretch of days alone in the studio, intent on work, makes me feel like i dropped off the face of the earth! 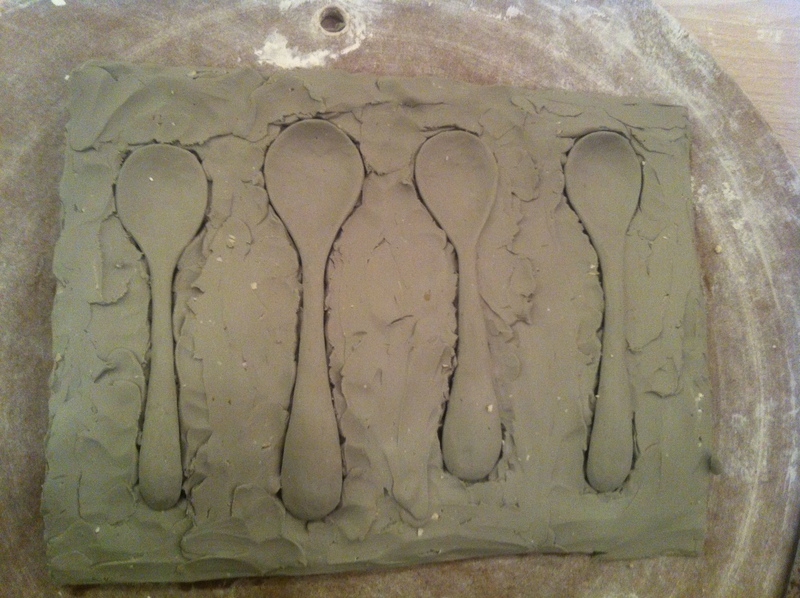 i've been working on some new spoon molds: here's an image of the plasticine positives, partly embedded in more plasticine, almost ready for the first pour of plaster to make one part of the two part mold! can't wait to finish the mold so i can start casting these little guys! and if you are obsessed with little things like i am, make sure to check out the clay studio small favors show! who doesn't love tiny things...especially those made by hand! below is my salt and pepper set in the show. and don't forget the Paradise City Arts Show in Northampton, MA this weekend! i've been cranking out some new work and will be there all weekend...with my mom! it's a really great show, and my mom makes everything ten times more fun so make sure you stop by! and finally, just wanted to share how excited i am that one of my little espresso cups was chosen as a cup of merit in the NCECA Annual Cup Sale this year in Houston! especially exciting since the cup sale has always been one of my favorite parts of NCECA! 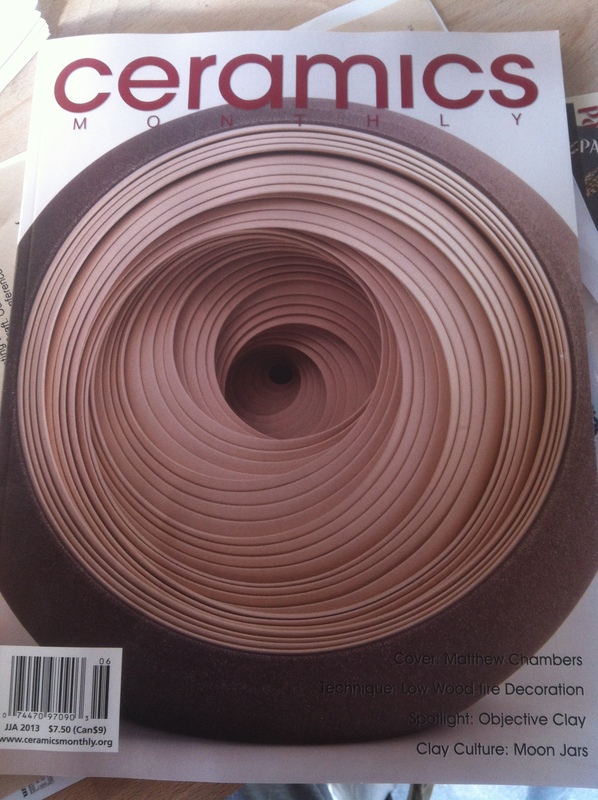 Super excited to open the june/july/august edition of ceramics monthly to find an image of my cup from the NCECA biennial show in Houston! a dream come true! Excited to be Red Star Studio's digital debut artist this month! Check out all of my new work on their website! Nicole is influenced by an intense longing to reconnect with her past, which she satisfies by establishing intimate connections through her work. 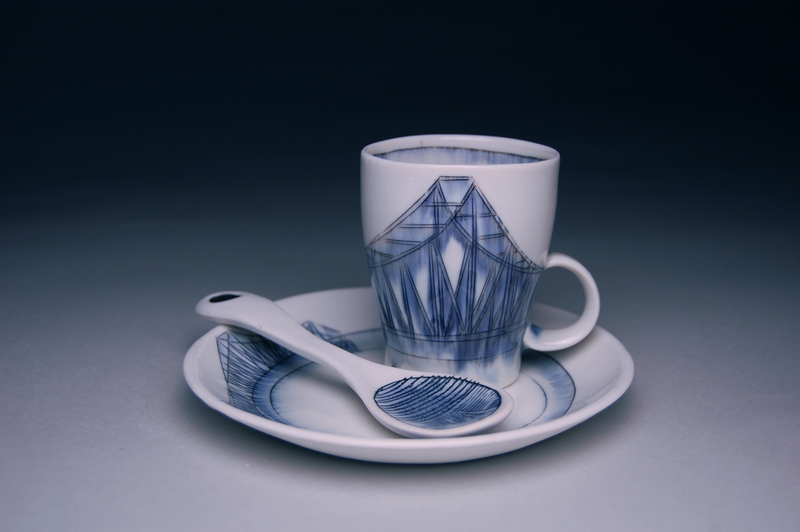 Through the labor-intensive act of making, she establishes a close personal relationship with each piece; a connection which is effortlessly transferred through the functionality of tableware. 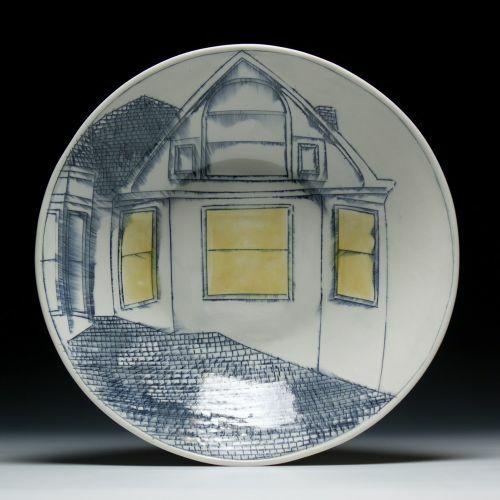 Architectural imagery drawn from Nicole's photographic collection, coupled with the movement of glaze, bind her past with her work. In addition to the personal connection, Aquillano's work explores the notion of holding onto memories through personal collections; as if a tangible object also allows us to better hold onto our memories. Nicole's experiences are carved onto objects intended to be both used and collected as a way to facilitate new experiences. 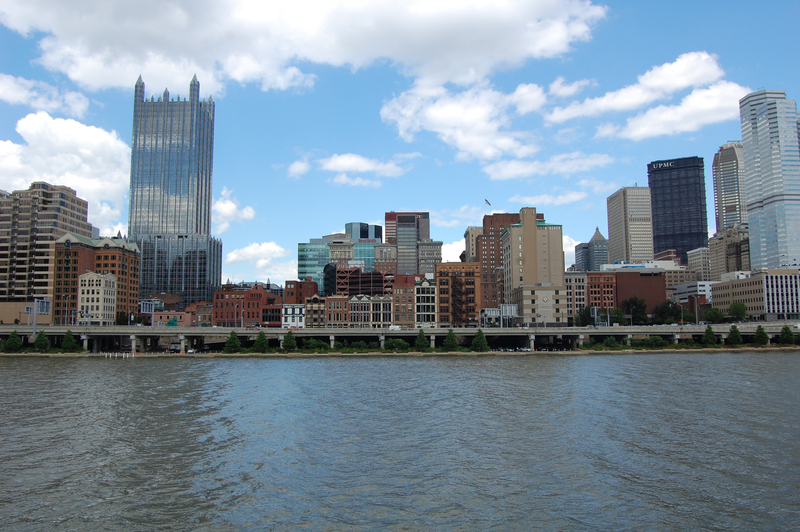 Nicole Aquillano was raised in Pittsburgh, Pennsylvania as Nicole Kowalski. She received a BS in mathematics from Carlow University in 2004 and a BS in civil engineering from Carnegie Mellon University in 2005. 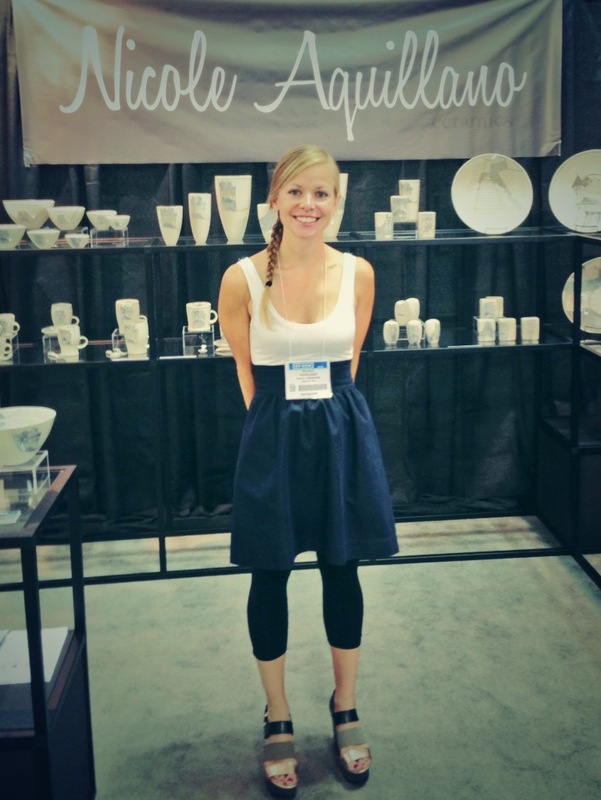 The following year, she moved to Boston to pursue a career at the Environmental Protection Agency, all the while pursuing her passion in ceramics. 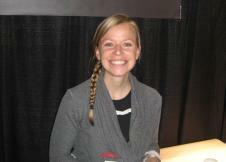 In 2010, she followed her passion to Rhode Island School of Design and earned her MFA in ceramics. Nicole now happily lives and works at Midway Studios in the Fort Point Area of Boston. Be sure to check out all the great shows going on at Red Star this month! For full text, check out their current exhibition page! 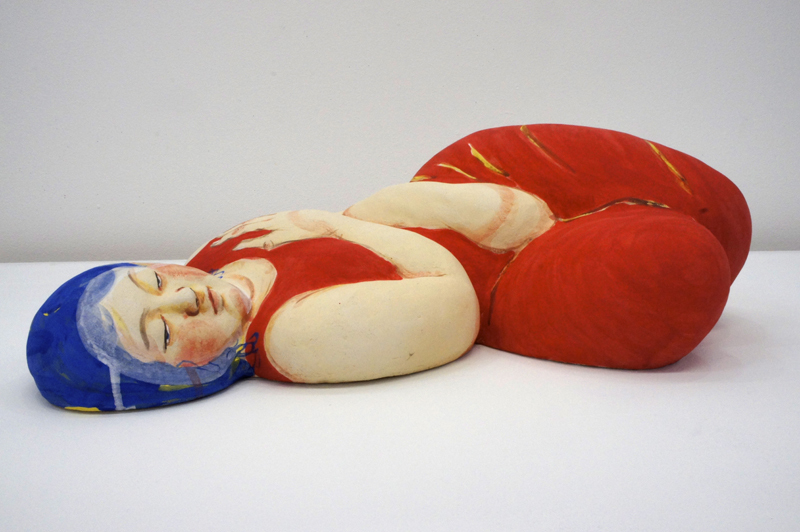 Red Star Studios, in collaboration with the Belger Arts Center, Kansas City Art Institute, and Barry Friedman Ltd., is pleased to present LUST, an exhibition of figurative sculptures by Japanese-American artist, Akio Takamori. Takamori has received international recognition for his diverse body of work, which is informed by his multicultural background, ideas of cultural identity, and by ever-changing global influences. He explores and crosses boundaries physically and mentally between East and West, letters and words, and form and meaning. Red Star Studios is pleased to present an exhibition by resident artist Jessica Brandl that is a culmination of her artistic residency at Red Star Studios. 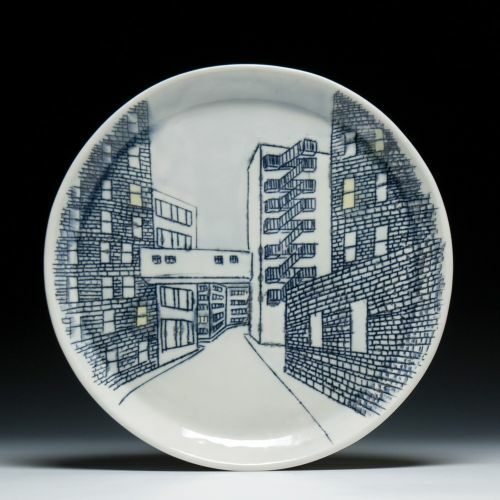 With her new body of work, Brandl has created visual prose through monochromatic narrative scenes painted on functional ceramics. Red Star Studios presents an exhibition of new work by resident artists, Ryan Fletcher and Cassidy Creek. This exhibition is a culmination of their artistic residencies at Red Star Studios. 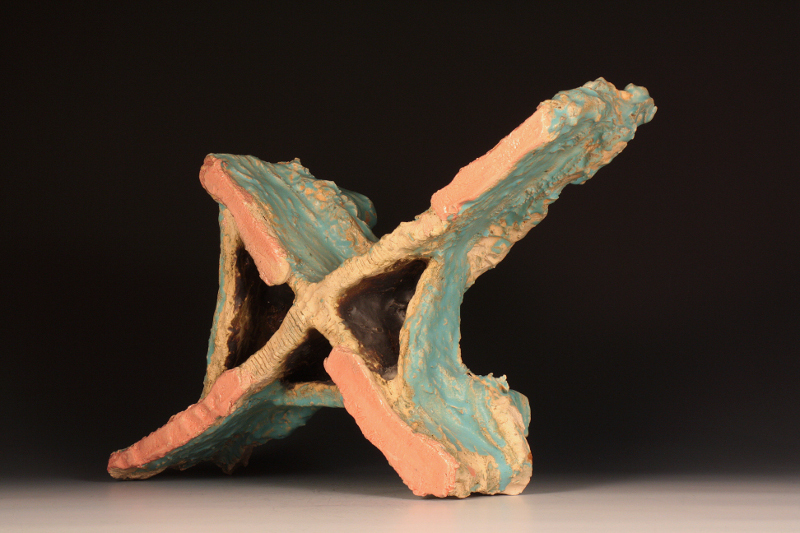 For this exhibition, Cassidy Creek uses hand-building techniques to create ceramic sculptures that highlight her observations of natural and man- made systems. Ryan Fletcher's work ranges from experimental sculpture to functional objects. 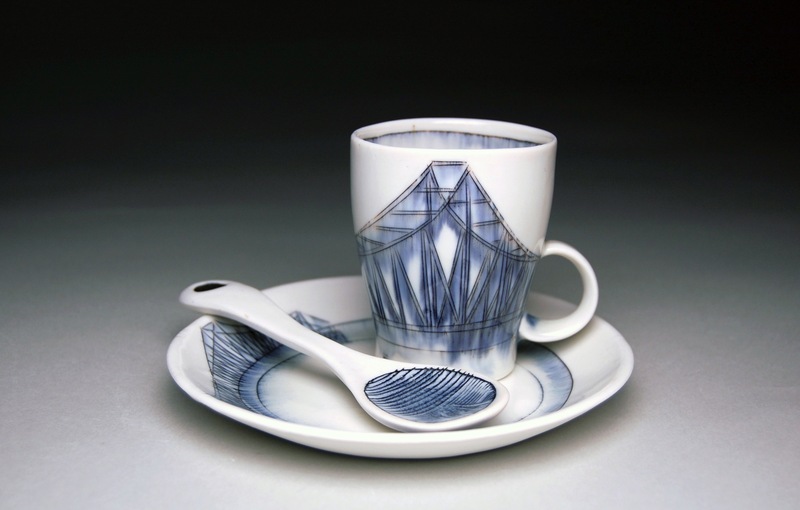 This exhibition includes sculptural yet functional ceramic designs he's created for food presentation. 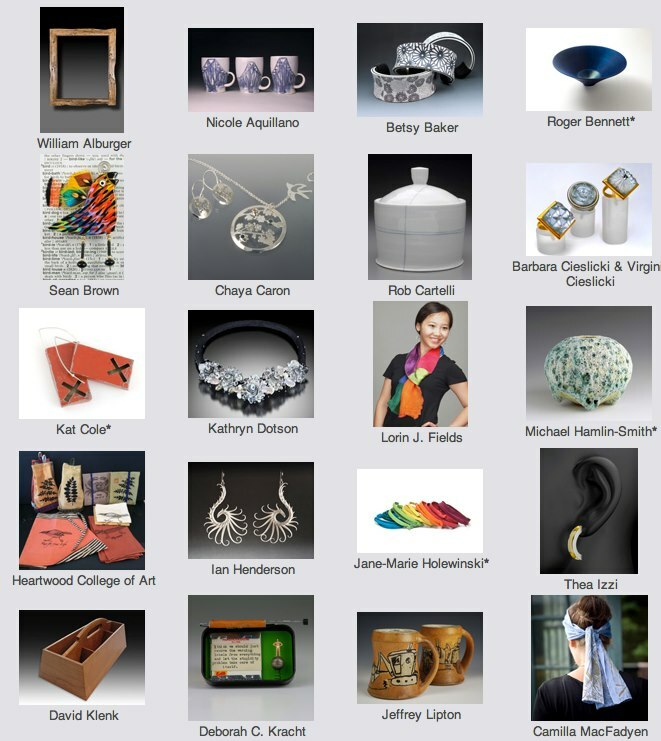 Come visit the exciting studios of Fort Point Artists this coming weekend! Be sure to come early to pick up a free artist-created flower, while supplies last! 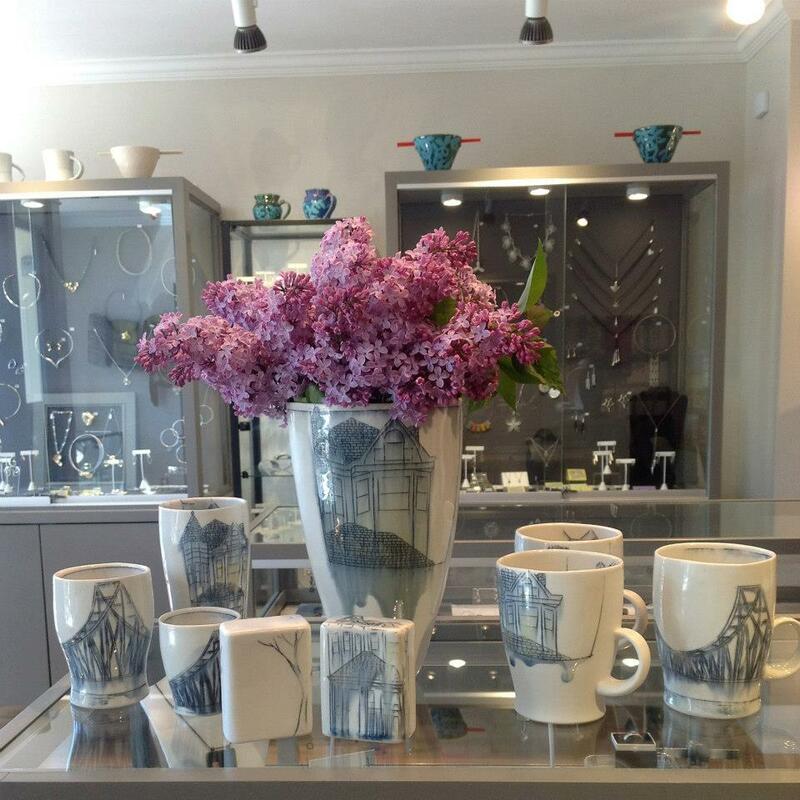 Fort Point artists have created imaginative flowers in all media, from prints to drawings and ceramics. Visitors can pick up flowers at the information booth at A and Binford Streets while they last! My "flowers" are the spoons above! Not will you get to see some great art in the spaces we create our art, but there will be some fun demos to check out, including yours truly doing a demo on slipcasting and inlay techniques at Midway Studios #211 at 2pm on Saturday! 75 artists open their studios in Boston’s Fort Point, along with galleries, creative design shops, and outdoor public art installations. Pick up a map at any participating building and explore the studios of painters, jewelers, ceramicists, photographers, sculptors, textile artists, and more. Talk with artists in their studios and discover new works and treasured favorites. Explore Boston’s changing Fort Point neighborhood and see the unique waterfront warehouse district that is one of New England’s largest and oldest arts communities. Enjoy the opportunity to purchase works of art and fine craft directly from local artists. Art Walk will be held on Mother’s Day Weekend, making it the perfect place to shop with or for your family. Artists’ demonstrations, performances, and special events are scheduled throughout the weekend. A full list of demonstrations and special events are available on the Fort Point Open Studios website. Studios are all located within a four-block area, a short walk from T and commuter rail at South Station in downtown Boston, and the Silver Line Courthouse stop. Art Walk is self-guided: maps and directories will be available at our information booth at the corner of A and Binford Streets and in all participating buildings. Locations of studios and galleries include: 15 Channel Center, 25 Channel Center Street, 249 A Street, 319 A Street, 347 Congress Street, 346 Congress Street. Additionally, free parking will be available in the Central Parking Lot directly across from 249 A Street, thanks to Gillette/P&G and Central Parking. Admission to this event is free! Come visit and support your local artists! So said a lady as she came through the door of CraftBoston on Saturday, April 20. The show was to have opened the day before, but the manhunt for the Marathon bombers was in full swing, and the city was basically shut down. Public transport wasn’t running, and the populace was told to stay indoors. By Saturday, after living through the terror of the bombing, the shootings, and the capture, people were ready to get out and begin healing their wounded spirits. The term "Boston Strong" had been coined, and many of Boston’s strong chose the beauty of CraftBoston as their balm. Artisan and writer Michael Scarborough creates decorative arts pieces and studio furniture inspired by his childhood in Japan. 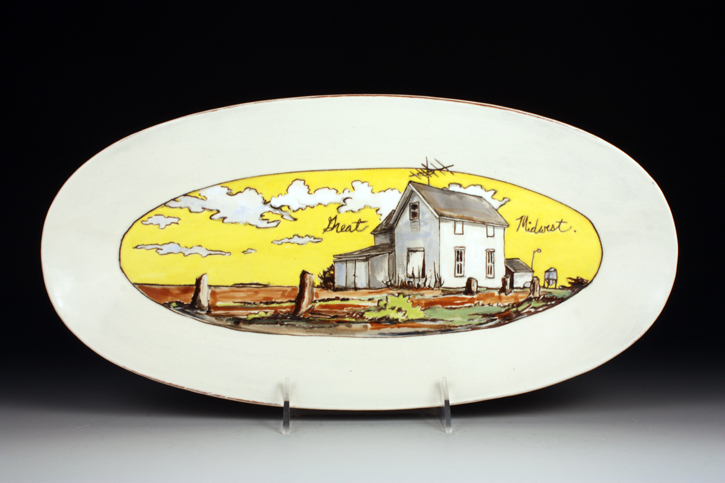 His work has been exhibited at the American Folk Art Museum, The Center for Art in Wood, and the Delaware Art Museum, and it can be found in private collections across the country. See more of Michael's pieces on his website, or view them in person at our American Craft Council Show in San Francisco, August 2-4, 2013. 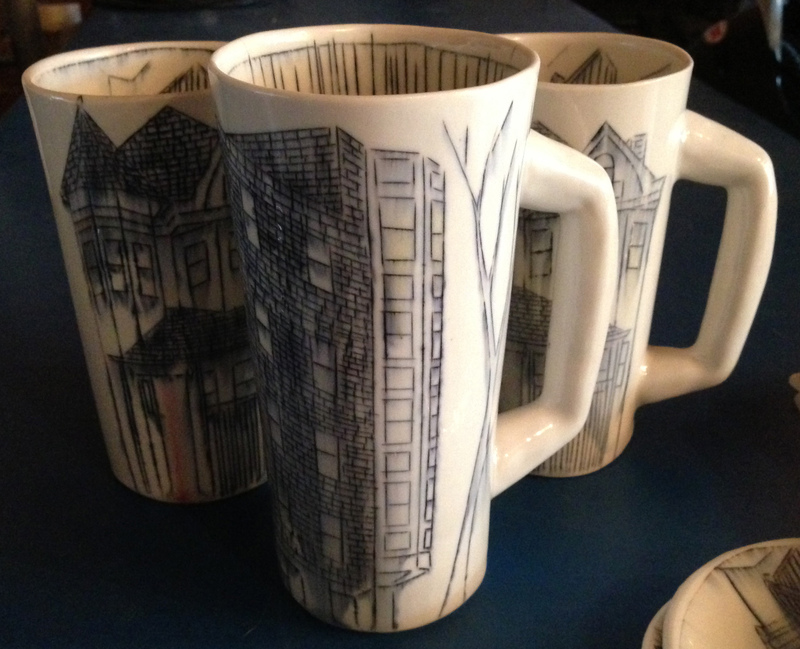 Just a few days until the RISD Alumni Sale this Saturday on Benefit Street in Providence from 10am until 4pm. I just finished some exciting new work and will be packing it all up to bring to RISD to show and sell! Open Studios Come visit me in my studio and see where I make my work during Fort Point Open Studios/Art Walk next weekend May 10-12th. I will be giving a demo, time and date yet to be announced, but it is guaranteed to be a fun weekend! 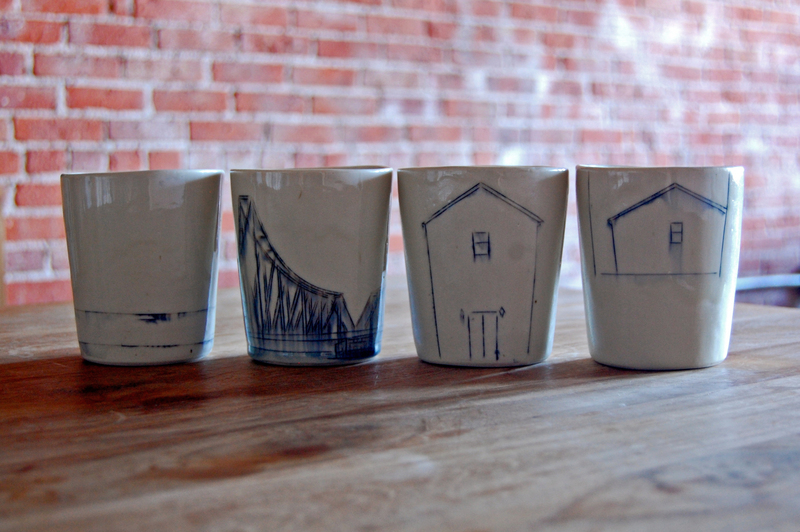 Fellow Fort Point artists will have their studios open with lots of new work to show! Society of Arts and Crafts In the window of Society of Arts and Crafts during the month of May: 3 potters with 3 techniques, and I am one of the potters highlighted! SAC has a great retail gallery full of handmade artwork, check it out at 175 Newbury Street in Boston. Lacoste Gallery If you are near Concord, MA, stop by the Lacoste Gallery to see some of my new work on display alongside some other great Blue and White Ceramics. And finally, come see me at my first Paradise City show in Northampton, MA on May 25-27th Should be a good time! Come see some great art in beautiful Northampton over Memorial Day weekend! 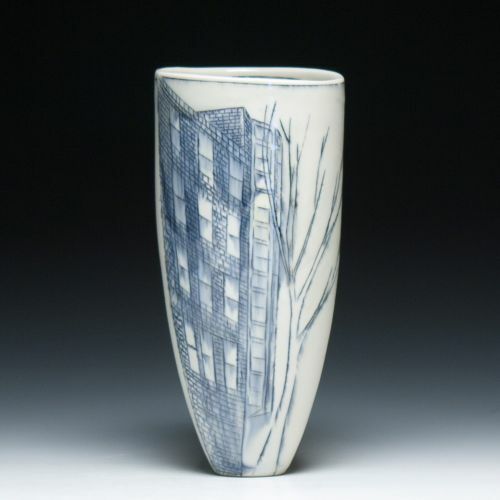 The Society of Arts and Crafts on Newbury Street has in the window for the month of May the work of three ceramic artists using different techniques to achieve captivating results. 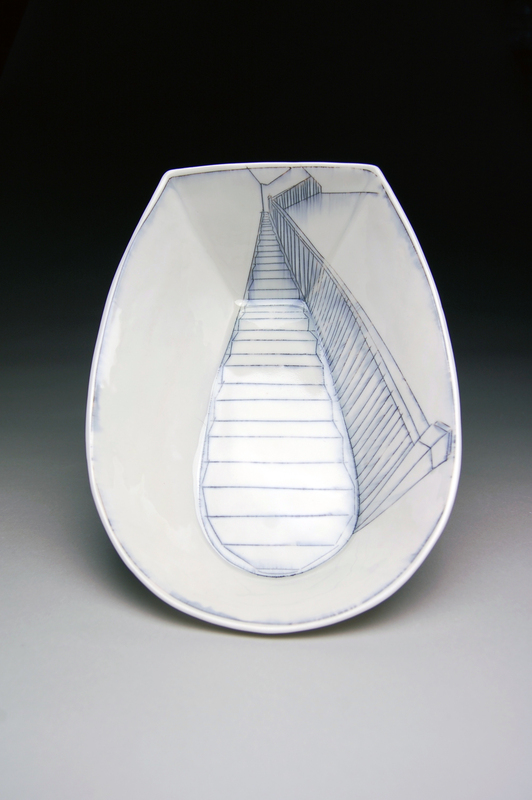 The imagery in Sally Jaffee's wheel thrown work has been hand etched through layers of slip on white stoneware and has it's roots in Japanese tradition. 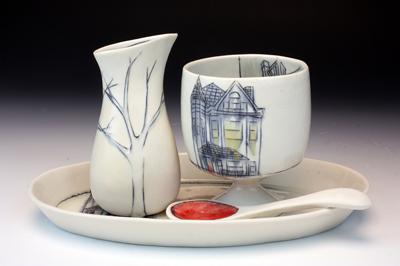 A red glaze is added around the drawing, and then high fired in an oxidation atmosphere. A second low fire gives the work a satin finish. Jeremy Randall uses textures and asymmetry to reference aging industrial and agricultural structures. His vibrant architecturally-inspired vessels are slab built and finished with terra sigillata instead of a glaze. The burnished surface is reminicent of antique milk paint. Nicole Aquillano uses a slip-cast technique of turning plaster positives on the wheel. She draws directly onto the final form before firing and glazing. Architectural imagery drawn from her photographic collection, coupled with the movement of glaze, elicits memories of times past. Check out more here! And visit the SAC at 175 Newbury Street in Boston! Explore more than 75 artists’ studios in Fort Point’s historic warehouse buildings. 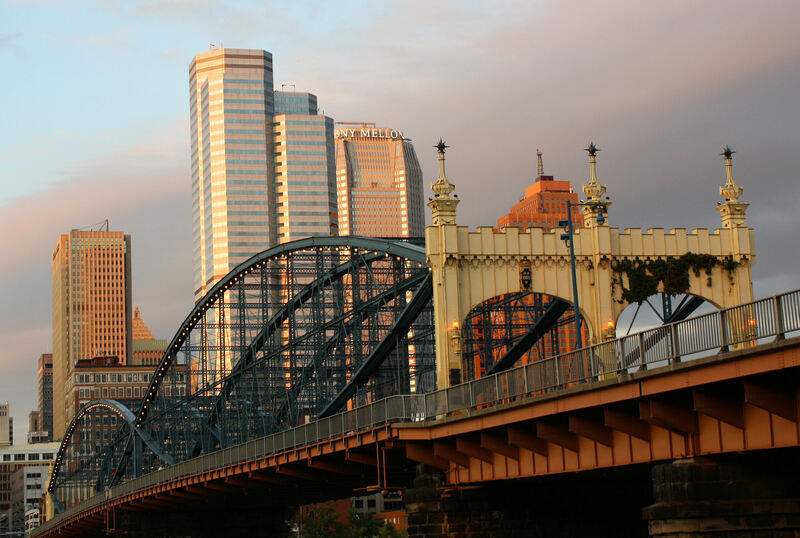 See amazing public art, visit galleries, ask questions. Stroll, ponder and browse. Savor the experience. And buy original art from the people who make it. finally added process images on my site! check it out here! so excited to begin working with Lucy and her associates at Lacoste Gallery in Concord, MA. so excited in fact, that I felt the need to mark the occasion with the purchase of a piece of new ceramic work. this little goblet by deb schwartzkopf was just too sweet not to take home with me. it will serve me well: as both a reminder of the past and of how far i've come. plus it makes your drink taste extra special! thanks for being awesome deb! woke up feeling rejuvenated after a relieving end to yesterday in boston and a full night of sleep. 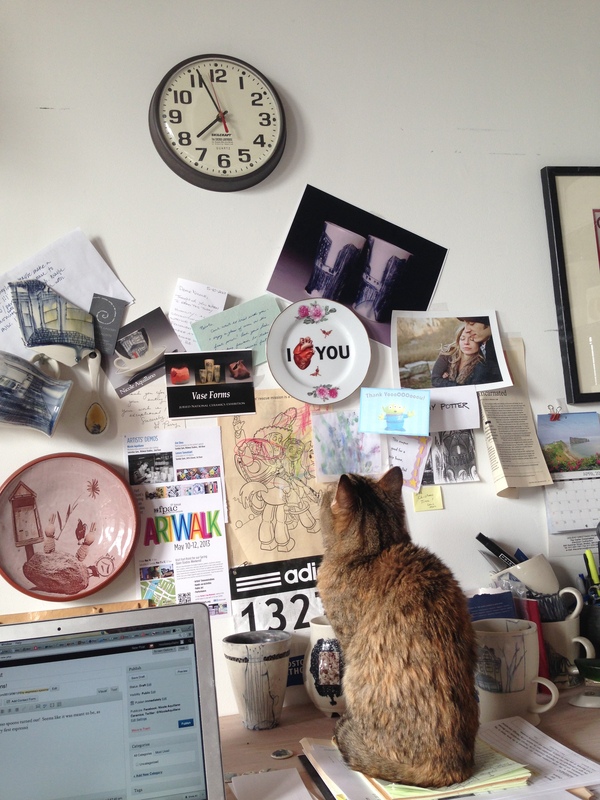 and then saw this: an image of my work on apartmenttherapy.com, which brought a smile to my face! Come see both me and my work at CraftBoston today and tomorrow! check out my new work at the clay studio here! Excited to work with the wonderful people at MoCC in Portland, Oregon! 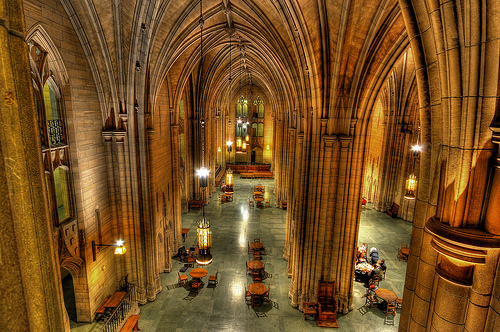 Looking forward to visiting soon! awaited me this morning in the studio! Just a sampling of some new work I'll have at Craftboston later this month - be sure to stop by and check it out! gearing up for craftboston. come see the show! there will be awesome handmade work on display, and what better place to pick up a one-of-a-kind mother's day gift to show your mom how much you care! check out the artists selling craft under $100 here! Packing up some work to send to shows and found a nice write-up on the Baltimore Clayworks website about their upcoming show "Game, Set, Match" set to open on the 20th of this month! check it out here!